Add some creepy decor to your Halloween when you bring home the Swinging Happy Clown Doll. Create a 3-ring fright fest when you bring home the Swinging Maniacal Happy Homicidal Carnival Circus Clown Doll! This creepy prop features an infra-red sensor, eerie glowing eyes, and makes haunting sounds of growling laughter to all passersby as his rotating head turns side-to-side, swinging back and forth. 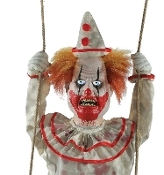 Your haunted house will be a circus of terror with the Swinging Happy Homicidal Clown Doll! Hang from any pipe! Choose from Steady-On or Infra-Red Sensor activation options to operate. UL 110v power cord included. Infra-red sensor works up to 6.5 feet (195cm) distance and works in all lighting conditions - bright light to no light! Includes volume control. Assembly required. Materials: Polyester, PVC, sponge, plastic, hemp rope, electronics. Doll approx 39-inch (98cm) tall. Includes swing mechanism, rope and doll. Total length approx 46-inch (115cm) High.